For many years I ran a weekend voice workshop called Everyone Can Sing. It was a large part of my life, not just in time and income but in how profoundly rewarding the work was and how much it changed me as a teacher and group leader, as a singer and performer and also as a human being. From undertaking this work, I documented several essays about the methods used – about respect, criticism & confidence and about community development. Those essays were published on my previous music website, which is no longer online. So here is a very short precis with a few typical student quotes, as a taster of this important work. Feel free to contact me if you would like to know more. Over 23 years the course attracted nearly 6,000 participants from all over Europe and beyond and it regularly sold out, sometimes with waiting lists as long as 2 years. 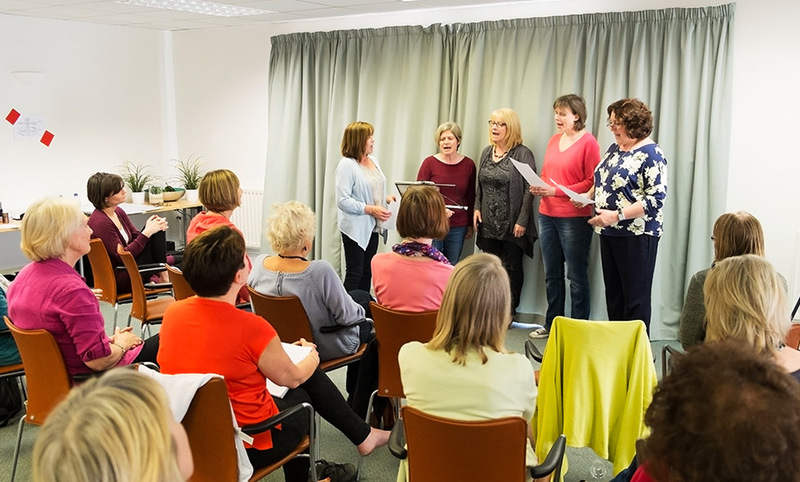 Singers of absolutely all levels came to enjoy and improve – from professional opera singers to the tone deaf and even clinically deaf. Yet the course was aptly named, as everyone can indeed sing, if provided with the right help and support. 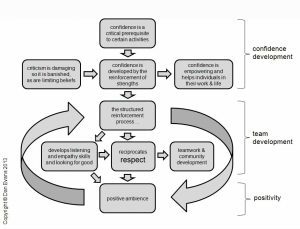 When I realised that confidence is key to many types of performance and that confidence is damaged by criticism, then criticism of any sort was banished on this course. I also realised that criticism serves the needs of the giver, not the recipient, which confirmed my approach. The simple act of removing criticism and declaring so at the start of the course, had many surprising and enormous benefits. Everyone relaxed and became brave enough to experiment which, with the right guidance, lead to outstanding results. Moreover, an ambience of profound respect prevailed, in which groups quickly bonded and developed what I call ‘real community’. In these ‘real communities’ differences are celebrated, not just tolerated and competition vanishes in an ambience of positive mutual support. I have named the process I developed ‘the engine’ and it has also been used in leadership and management skills coaching. Deploying the engine on courses be they music, management skills (or anything else for that matter) gives rise to three virtues: confidence development, team work & community and a positive ambience. The following chart gives a brief overview of the engine and shows (with the curved arrows) that the engine runs on long after the course has finished, as the virtues are profound and enduring.